Wat Phu Tok is a temple built on Phu Tok (a hill) in the Bueng Kan Province of north east Thailand. The temple is famous for its stunning views and vertiginous walkways up and around the 359 metre metre tall Phu Tok, which rises up dramatically from an otherwise completely flat landscape. Wat Phu Tok is open daily from 06:30 to 08:00 except for the week in which the annual Songkran festival takes place (the middle of April) and admission is free. Wat Phu Tok covers an area leading up to the hill, and the hill itself. As you approach the temple there are car parks, toilets, some immaculately maintained gardens and a lake, but no shops so bring water and food with you. You will need to bring drinking water for the walk up Phu Tok. 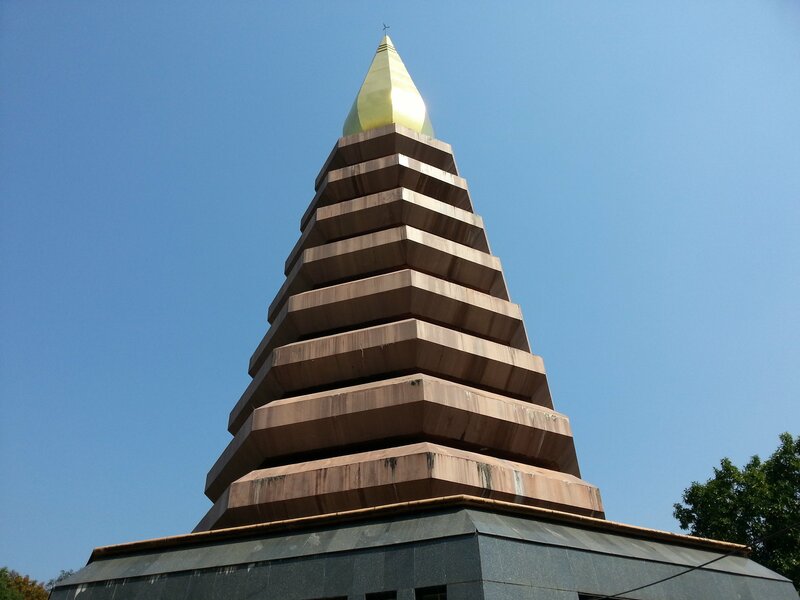 There is also a large chedi (tower) Wat Phu Tok in the temple grounds before you get to the start of the walk. 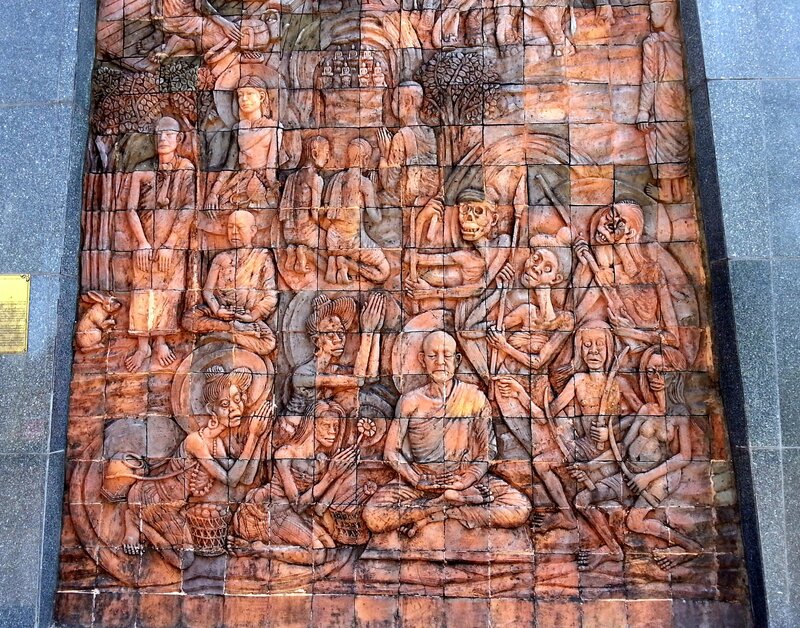 The chedi at Wat Phu Tok is dedicated to Ajahn Juan who founded the temple in 1968, and was responsible for the installation of the wooden walkway and stairs which make Phu Tok accessible to visitors. Ajahn Juan was an important monk who was a member of Thailand’s forest monastery movement, which is a sect within the Buddhist clergy which believes in leading an aesthetic lifestyle living in remote areas, removed from the conveniences and distractions of modern life and therefore enabling monks to focus on meditation. 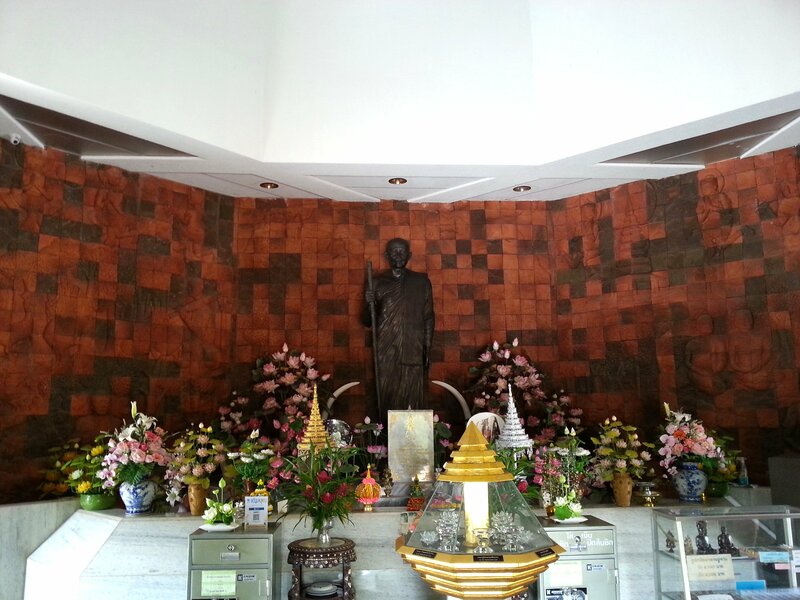 Ajahn Juan is revered by many Thai Buddhists in the same way a saint would be in the Christian tradition, and the chedi contains a shrine to Ajhan Juan with a statue and some fragments of his bones and hair. After visiting the chedi carry on straight along the road to the start of the walk to the top of Phu Tok. The walk has 7 levels representing the 7 stages in the path to enlightenment in Buddhist theology. Levels 1 to 4 are reached by a straight ascent up wooden and stone stairs. This part of the walk is the most physically demanding. 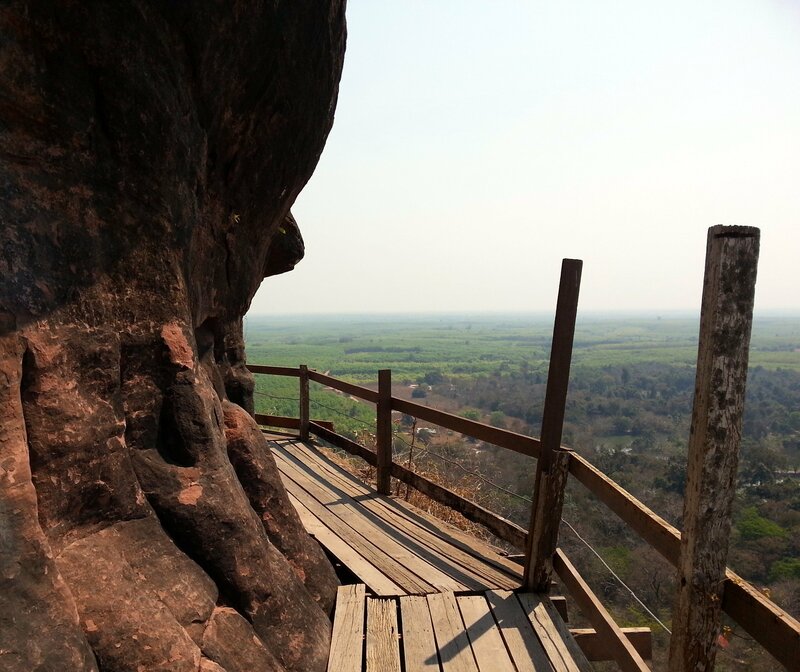 At the top of the 4th level of Wat Phu Tok you have the option to go either left or right. The right hand path takes you to the rickety wooden walkways and stairs from which you get the best views. The left hand path takes you straight to the shrines. If you are fairly good with heights and reasonably physically fit then we recommend that you go up via the right hand path and back around the hill via the path you see on the left which goes past the shrines. Once you have ascended the staircase to level 5 the views appear from a wooden walkway which clings precariously to the side of a sheer sandstone cliff dropping straight down several hundred metres to the base of the hill. Take this part of the walk slowly and don’t lean on the outer rail. The rail is a guide only and looks insufficiently strong to bear much weight. You need to walk around the walkway until you come to the next flight of very steep wooden stairs. 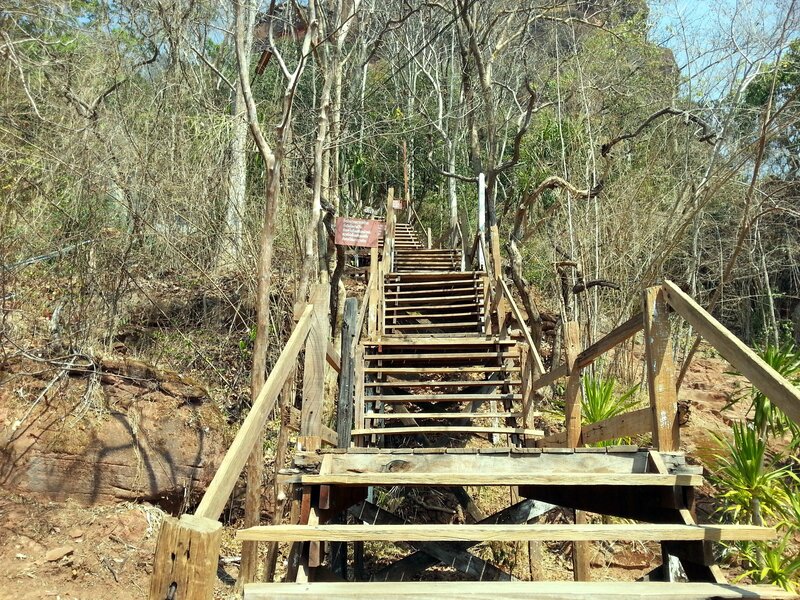 Level 6 of Wat Phu Tok has the second set and last set of long wooden walkways. Keep on going carefully around the side of the hill. 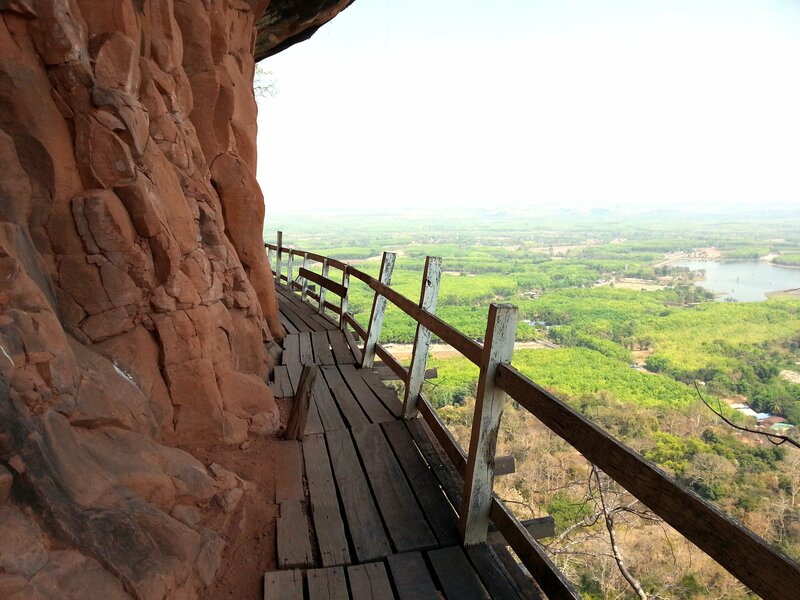 The last part of the walkway on level 6 of Wat Phu Tok is the part where people tend to feel the height most, and if you are going to experience vertigo then this is where it will happen. Carrying on going carefully as this section of walkway is less than 100 metres long and after that the scary bits of the walk have been completed. 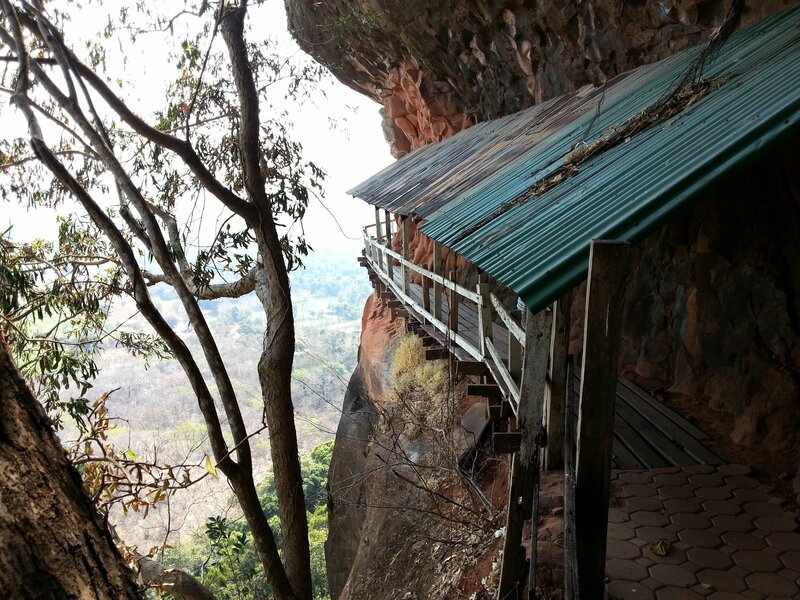 There is a 7th level of Wat Phu Tok which is the very top of the mountain. 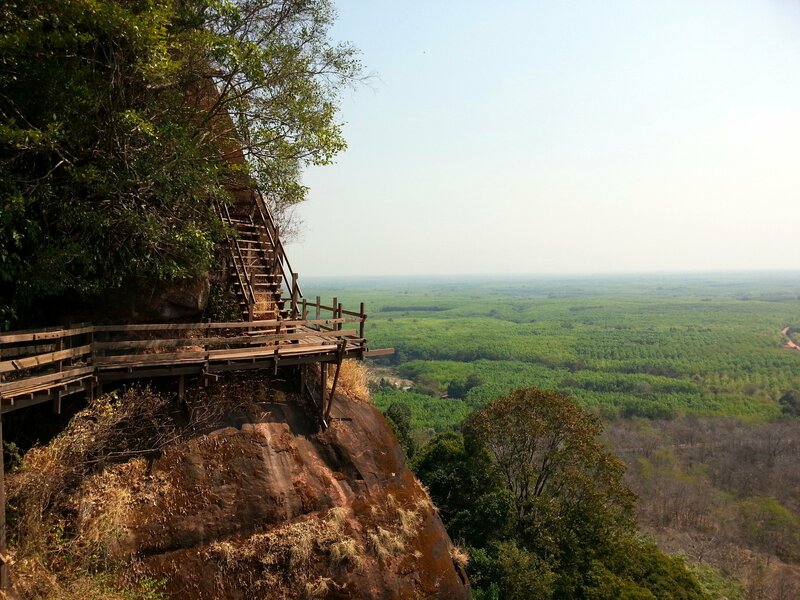 There isn’t much there and few clear views as the area has tall trees, and signs in Thai warning people of snakes. Instead of going up to level 7 you can instead takes more steep wooden steps down to level 5. 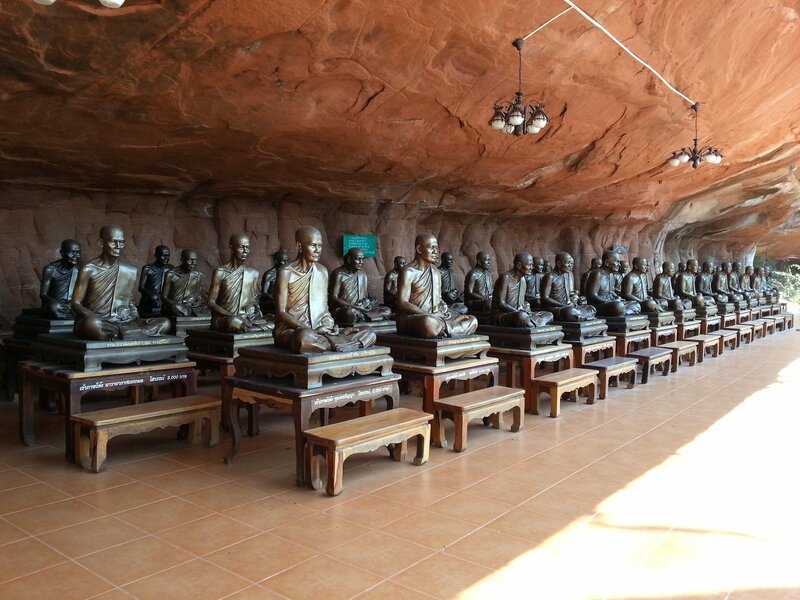 If you follow the path you will come to to an overhang in the cliff path with around 100 life sized statues of important monks. 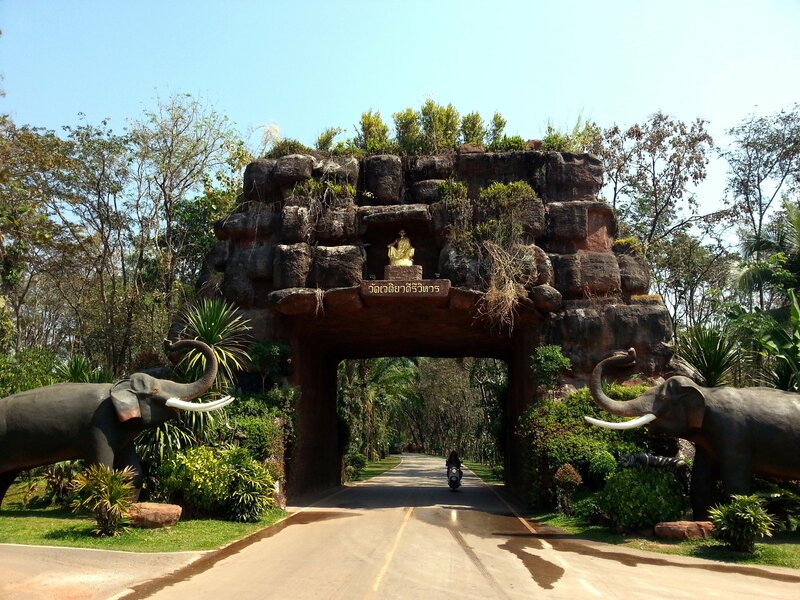 This is impressive and one of the highlights of a visit to Wat Phu Tok. As you carry around the path you come to several more overhangs in the cliff face, some with more shrines and one with a cave which looks as though it is being prepared for another shrine. Wat Phu Tok has been a work in progress since it was started in 1968 and more things are constantly being added to the temple. When we go back in a few years time no doubt there will be some new shrines and statues to see. 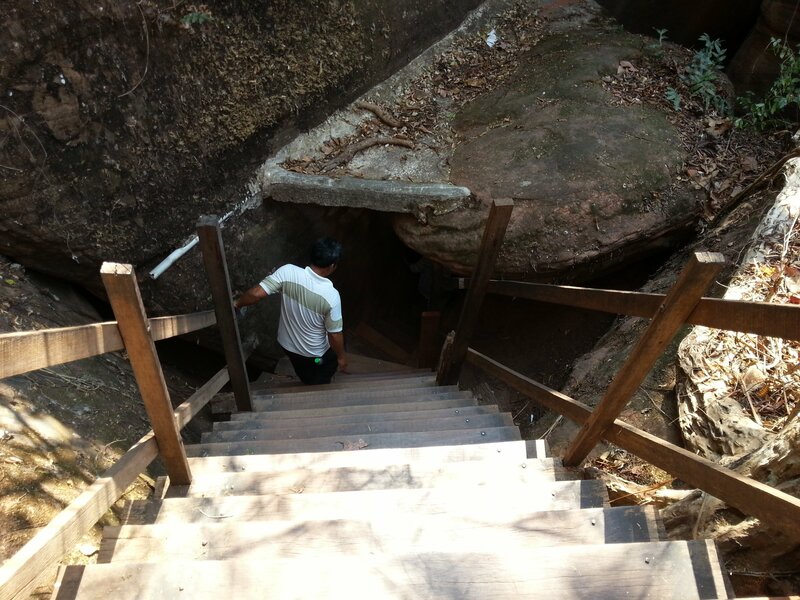 The final point of interest on the walk around Wat Phu Tok, back to the junction at the top of level 4, is a cave through which the stairs down from level 5 descent. 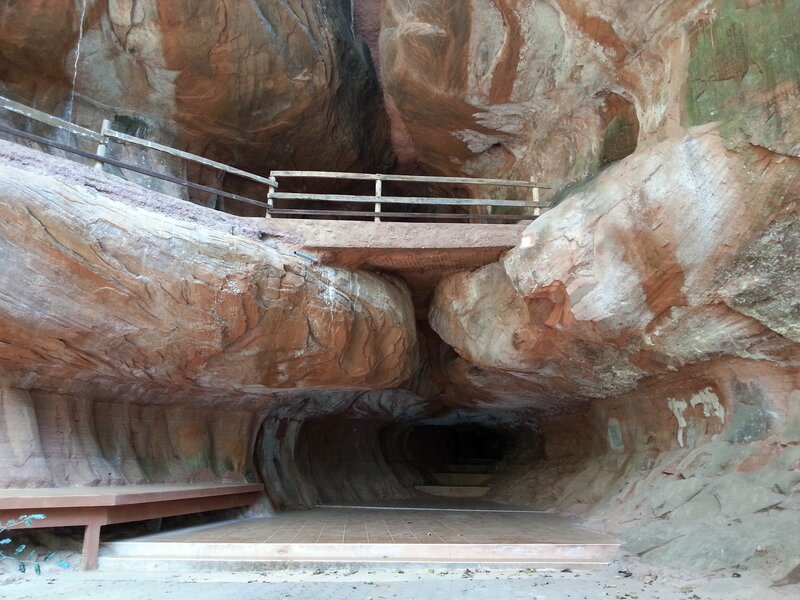 The cave has been formed by a natural large crack in the cliff, with steps carved out of the bottom of the crack and connecting wooden stairs allowing visitors to safely descent back down the hill. The walk around Phu Tok hill is enjoyable and exhilarating and you are likely to feel a sense of achievement and relief when you finish it. The total walk should take around 2 hours, which if why you need to take drinking water with you. 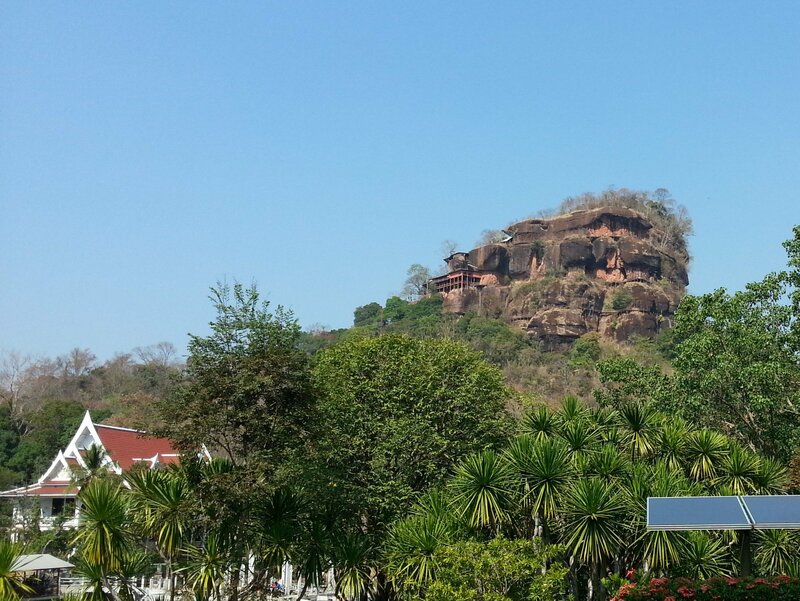 Wat Phu Tok is located 46.7 km by road from Bueng Kan Bus Station.